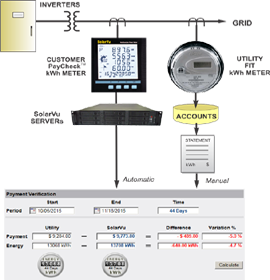 To reconcile each utility payment with the actual energy produced, the customer owned revenue grade PayCheck™ energy meter is monitored which is installed at the same measurement point as the LDC FIT meter. This ensures any system losses that are not reflected in the inverter reported output do not affect the readings. Any combination or type of inverters can be used. On the PayCheck™ screen, enter in the energy and revenue for the period covered from the customer LDC statement. PayCheck™ will show the corresponding values measured by NRGpilot™ through the IPP's own meter. 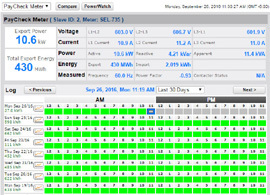 If the variation is significant, the IPP can print the NRGpilot™ daily energy log and review with the LDC against utility records to determine why. This ensures any issues are detected early and the correct compensation is received. Printed reports can serve as an audit for investors that the revenues received and payouts made are accurate. Grid issues like periodic voltage fluctuations can result in costly shutdowns that are difficult to detect, especially if intermittent. With the PayCheck™ option, 90 day logs of all measured total system output meter values at 10 minute intervals can be examined to identify the cause. Use the log values to demonstrate and work with the LDC to correct utility related issues. Equipment related issues like phase unbalance or excessive power factor can also be identified. 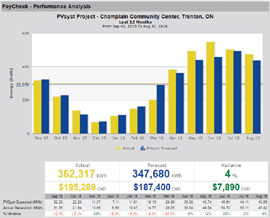 Whether you are buying, selling or operating solar PV sites, generate performance analysis reports to demonstrate bankable results. Enter the PVsyst original design values once then let NRGpilot™ calculate the energy and revenue variance to designed output for any time period. With the PayCheck™ meter installed, get the same reports that separate asset management software provides without the expense. Demonstrate actual measured values to realize the full site value when selling. Protect from over paying when buying an existing project that does not meet specifications. Verify performance guarantees on a portfolio of sites. Solar farm operators can analyse each section of the total project. If the variance is below expected, use the NRGpilot™ Analyzer tools for detailed measurements to determine why, then take corrective action.